You are originally from Houston, Texas and you attended the famous High School for the Performing and Visual Arts in Houston. The list of alumni of this high school who became world famous jazz artists is pretty long: Jason Moran, Robert Glasper, Eric Harland, Chris Dave. What is so special about that high school that so many great musicians came out of it? What was your experience there? Well, the thing about it is… it’s not just the high school. In the US there are only a few cities that have, or I should say used to have, strong arts programs. Those programs would start in the elementary school and continue all the way through middle school and high school. Houston happens to be one of those cities. I started playing violin when I was four years old, in school. And then I switched to the clarinet and saxophone when I was six. So, growing up I played in school, in addition to taking private lessons outside of it. A lot of people had that experience. There is also a very strong live music scene related to the gospel music. A lot of the guys that you just mentioned - Robert Glasper, Eric Harland, Chris Dave - they grew up playing in church. By the time you get to that high school, only the best of the best of the kids want to continue playing. Besides that, there are a lot of amazing musicians who live there and are a part of the education system. Speaking of my experience there… I was a couple years behind Glasper and he was in class with Mike Moreno, great guitarist. Kendrick Scott was in my grade. We started in the ninth grade together. He was the first person that I met when I went there. So, because of all the guys who went there - Jason Moran, Eric Harland - we had that inspiration. They moved to New York but we were trying to find the records that they played on and follow what they were doing. This way we we would know what was happening in New York. During the Christmas time they would always come to Houston and they would stop by the school. I got to meet Eric when I was thirteen and in the ninth grade. At that time he was playing with Betty Carter already. It was very encouraging to us to have that kind of person say ‘Oh man, you sound good. You should really keep working on this.. working on that.. when you get to New York give me a call.’ It was really cool! And I think that has carried on into our adult lives. There was a real sense of community. Everyone looked out for one another. 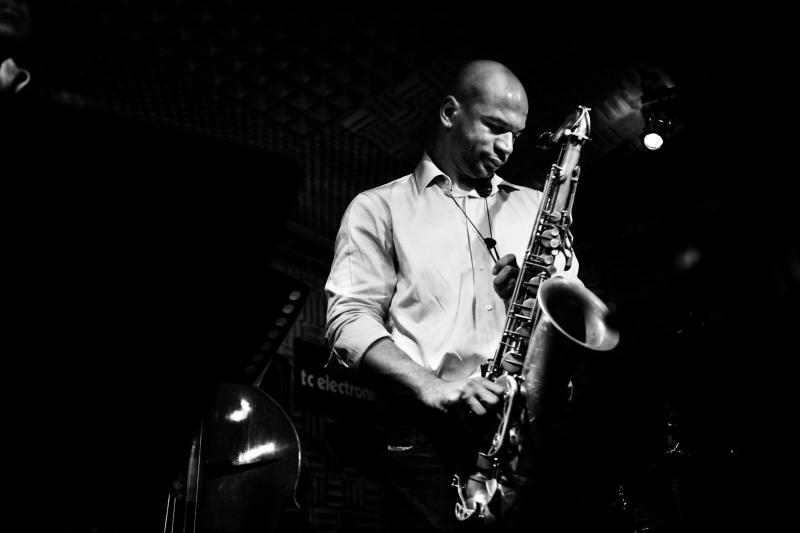 Eric Harland has gotten Kendrick and Jamire (Williams) a gig. Moran has hired me. There are still people coming out of that school. And when they come to New York they look out for each other. For example, piano player James Francies who is in New York now and is about to graduate from the New School. He is one of the people in the community of musicians who came from Houston. There are definitely this kind of communities in other cities as well. There is a music community in Miami. Another one in Berkeley California. Ambrose (Akinmusire), Charles Altura and Justin Brown come from there. A couple weeks ago I did an interview with David Kikoski who was talking about the huge affect that playing with Roy Haynes had on him. What is the most precious thing that you learned playing in the Roy Haynes' Fountain of Youth Band? Before I played with him my perspective was that people of his generation weren’t really open to the way people play currently. But he is one of those people who are always really pushing and being a big influence on what is happening at the moment. Can you say a little bit about your new trio album which was recorded just a couple weeks ago in New York? When I decided that I want to do a trio record, my whole thought process behind it was doing it with Roy. I waited a little too long with asking him about doing it. He’s not so into taking on projects like that at the moment. So I ended up calling Eric Harland to play drums, Christian McBride to play bass and Josh Redman to play saxophone. And actually this week we went in and re-recorded a couple things with Harish Raghavan on bass. The whole idea behind it was just to play some standards in the trio format. My previous albums featured mostly my original music. But all I grew up working on was playing standards and I’ve always wanted to do something with it. This felt like the right time to do it. I picked a bunch of songs that I liked that maybe aren’t super common. I started arranging and reharmonizing them and they almost started turning into original compositions. So I threw that idea out and just decided to play them as they exist normally, almost like on a jam session. There are a couple things that are arranged but it’s loose. I like it. It came out OK. It’s not what I expected but you know… the more that I force myself to listen to it I find some fun stuff on it. It should be done and out sometime in the Fall. In one of the interviews about your last record 'Still Casual' you said that the advantage of playing with people who you know well is that they aren't afraid to say whatever is on their mind. They aren't afraid to hurt someone's feelings. Do you feel like the political correctness of the modern world affects jazz in a negative way? Does the tendency towards in fake politeness lead to music becoming less honest and personal? Of course! There were some songs that I had written for ‘Still Casual’ that I wasn’t sure about. I brought them in. I don’t remember who it was but someone said ‘Yeah, you know, this one… not so much.’ I was already feeling that and everybody was like ‘It seems like something is not really working’. And I said ‘You know what? Great, let’s skip it! Let’s move on.’ In another situation someone could have said something like ‘No, actually, I like it.’ You know, just trying to be cool about it. That’s the way it works. A lot of time you have people who don’t want to get on someone’s bad side or they don’t want to present themselves as a negative person. But in that situation when you’re all really good friends and you play together a bunch you don’t feel like that’s coming across as being negative. It’s being honest. And between musicians, between friends, within any kind of relationship, the more you can get that actual honesty the better everything is. Especially as adults you have to be open to taking something that is not necessarily always a positive comment. You should actually appreciate when someone tells you that kind of stuff. As you know being a musician so often you run into somebody who would be like ‘Man, I just went to that concert. It was terrible! Everything was out of tune.’ And then the guys walk by and they’re like ‘Hey man, great set, etc…’ And I’m just thinking ‘Wait, why are you even saying that?’. And for me, if it’s someone that I’m close to, I always tell them what I think - if they ask me. But also just not saying anything is actually something meaningful to say. I try to never do that false thing like ‘Sounded great man!’ I would just be like ‘Hey man, how are you doing?’ I won’t even address the musical part. The other thing about it is that you can do what you want with people’s opinions because everything is so subjective. Something that I might think is terrible you might have loved it. We might both feel very strongly about it and it’s an honest feeling. That’s how it goes. Even if friends tell you stuff that is honest and negative you still have to consider your own opinion. But I value my friends’ opinion a lot. On ‘Still Casual’ it really helped to make it come out the way it is. And out of all the stuff I ever recorded that’s the thing that I feel best about. You have a degree in Music Education from Berklee College of Music and are an active jazz educator in addition to having a great career as a performer. I’d like to ask you about your approach to teaching improvisation. In recent times, hundreds of books about playing over bebop chord changes have become available and some give the impression that playing jazz is a purely mathematical process. Do you think jazz pedagogy has become too codified? I think the books are cool. But personally I try to stay away from all that stuff and that’s how I think about teaching. I don’t think the music has been necessarily too codified. It’s just that people… I don’t want to say that they are lazy but a lot of students they just want you to give them everything. Or they want the book to tell them everything. That kind of personality leads to a lot of things sounding the same. For instance, let’s say I’m teaching you in a college and we are talking about improvisation and you have never thought about the stuff that we’re covering, you never tried to figure it out on your own. To me it’s just a very weird way of pursuing learning how to play. As a student, taking music classes I was always blown away by someone’s explanation of something that I already tried to figure out on my own. I had this way of thinking about that and then someone tells me ‘Well, it’s this, but you can also do this..’ and I’m like ‘oh, OK, right! That makes sense.’ I already have a way of doing it which is going to be different than everyone else’s in the class. In my approach to teaching I try not to give students anything. I ask them questions: ‘What do you think about this kind of thing’ and try to get them to come up with their own thoughts on stuff. And then I try to fill out the gaps when they miss certain things or certain concepts. To me it’s much more interesting to have someone come out sounding like Ambrose where you’re like ‘What the f**k is that?’ as opposed to someone coming out that has learned all the Joe Henderson stuff and sounding exactly like Joe Henderson. Joe Henderson is one of my favorite musicians but I don’t think that I would consider it a successful journey through school or into improvisation if that’s your end goal - to replicate something. It’s much more interesting and fun to try to figure out things and maybe be technically wrong, for example, ‘On this chord I think about this sound to play over it.’ Maybe some of the chord notes aren’t there but because your approach to playing develops further later on, it comes out as some really unique thing. Maybe some people don’t like, but maybe some people think its genius. That’s the kind of thing that we miss with all the books and with all the schools. And I myself, I’m a product of that. Going through schools, I spent a lot of time doing things on my own. But I was still convinced that I had to learn through school and I did change a lot of my playing. It affected how I think about music and how I perceive things. Since I mentioned Ambrose I’ll bring his example back. He went to school too but he had his own way of thinking about things that he stuck to. He didn’t waiver from it. I think it paid off because I think he is one of the most creative sounds that I’ve ever heard. And to me there’s way more value in that then for example trying to play Cherokee in all twelve keys which in the end is kind of pointless. Recently you posted a series of funny videos entitled “Hotel Lessons” on Facebook. They’ve gotten thousands of views from your fans around the world. What inspired you to record them? Was it inspired by students repeating generic questions about how to play outside or how to use fancy substitutions while not knowing the basics? (Laughs) I don’t know man… Eric Harland is always encouraging that kind of stuff. When we are on tour on the backstage there is this whole vibe where everyone is just being hilarious. And then we go on stage and suddenly it becomes this serious thing because it’s all about the music. Eric said that it’s so funny that the people who are coming to see us play picture us in one way while in reality we have totally different personalities. He also thought that it would be cool if there was a way to put stuff where you could see all the things that we really do, things that are funny. I did that randomly in a hotel and I was like ‘Yeah, whatever.’ One hour later there were like fifty thousand views! All these people were texting me like ‘This is hilarious!’ and I’m like ‘Seriously? ?’ I could post a video of me playing the best solo of my life and maybe it would get one ‘like’. I just posted something silly and that’s who I am really. That’s what people resonate with and it’s funny how it works. But I’m almost done with that though. I’ll do a couple more and then I’m gonna retire that. Those videos were definitely successful in Poland as well. I’ve seen many people share them on Facebook. (Laughs) It’s really funny. I was just in Japan and before that I was in Europe. People everywhere are coming to me and they are like ‘Man, I love those videos!’ And it’s like… ‘Ok, I should put a record now.’ Otherwise I’m just a video guy. I’d like to ask you about your experience with Poland. 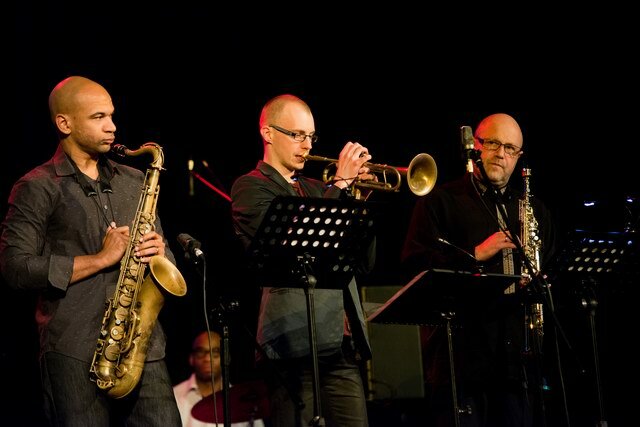 You have already toured in Poland at least twice: with the Piotr Schmidt Quintet and with the Piotr Lemanczyk Quartet. Do you have any special memories from these tours? Any interesting, funny situations? Yeah! I’ve been there a bunch with Terrence (Blanchard) and Ambrose too. It’s always a funny place because the musicians that you hang with in all the towns are hilarious! Having (Dave) Kikoski on the tour last year - that was hilarious, I didn’t know him before that tour. Just being around him was really funny. There was one musical thing. I think we were playing at the Blue Note in Poznań. They wanted to do a standard, I think it was an encore. Piotr (Lemańczyk) asked if we want to do ‘Alone Together’. I was like ‘Ok, cool!’ and then Kikoski was like ‘Well, I don’t really know that one…’ So I just laughed and I was like ‘Yeah, sure…’ - I was assuming he knows every tune. And then we went out and started playing so I play the melody and I kind of walk off to let him solo. He played and it was ridiculous but then he told me ‘I actually really don’t know this song. I think I’ve heard it but it sounds like a bunch of other once… I’ve never played it before.’ And I was like ‘Oh, I though you were just f****g around.’ So, that was a good one! Can you say a little bit about the CD that you recorded with Piotr Lemanczyk? It was cool and it came together really quickly. We did a couple gigs and then we went into the studio. And I thought that we were recording for two days because we only did one or two takes of the songs. And then Piotr said ‘Ok, that’s it.’ So I was like ‘What time are we coming back tomorrow?’ and he answered ‘No, no, no! That’s it. The record is done.’ I was like ‘Oh (laughs) cool!’ The music wasn’t easy. I like that approach to recording when it just documents what it is. He wrote some great tunes for it. We had a good tour, it was fun. We played a lot of good concerts and I think the record represents that. Do you enjoy European jazz and records from labels such as ECM? Of course! I listen to it just as much as I listen to the American musicians. I end up playing with a lot of guys from Europe. Doing a tour like the one with Piotr I get to meet many people and I meet them in a different way than when I tour with an American group. I really get to hang and I really get to know what’s happening in that city or country. I also get to see what the local musicians are playing, what they’re into. Getting to check out stuff like that first hand is really cool. Recently I did this record with a guitarist from France Romain Pilon and I’m going there this Summer. I’ve done a several things with people in France, Germany and Switzerland. It has been really cool to get into the local scenes. And ECM, of course! All that stuff that comes out! I listen to almost everything that comes out. I buy a lot of music. I try to stay well informed. It’s partially because I’m interested in it. But the other thing is, I live in Los Angeles and ever since I moved out of New York in a way I feel disconnected from the scene even though I play with people who are in New York. I feel like I don’t necessarily walk out of my house and go hear concerts every night. So to me it’s about hearing what’s new and who’s doing what. So I’m very into European music as well as all the American stuff.